For those eager to gain crew experience on board commercial or luxury yachts, training courses provide the most effective stepping stone into an industry of adventure. Although crew experience is, for those with maritime career ambitions at least, seen as an early step on the ladder towards becoming a senior member of staff that does not necessarily mean crew vacancies are the bottom rung and open to anyone willing to ‘muck in’. Rather than allow novices to learn the ropes while on the job, crew positions will often demand prior training and experience, particularly on commercial and luxury launches. Nevertheless, this is not to say beginners can’t secure hands-on crew experience on both modest private and commercial enterprises that prize hard graft over skill, but it’s unlikely to be paid work and more beneficial and career-advancing experience can be found by way of official training. An introductory course will provide hands-on experience of life onboard and, as part of a crew of other novices, you will learn how to steer, handle the rigging, keep a look out, row a dinghy and assist in all of the on board day to day duties. You will also gain a better understanding of maritime terminology, meteorology, helmsmanship, safety procedure and equipment, and also the boat and its constituent parts. The Royal Yachting Association (RYA) run a globally recognised course entitled ‘Competent Crew’, which takes place over five days and can be undertaken at training centres across Great Britain. This will give you the basic skills and confidence to be able to step onboard a working ship and immediately play an active and useful role within the crew. What’s more, once in possession of a Competent Crew certificate, you will find it easier to attract potential employers and secure valuable crew placements to add to your log book. If seeking crew roles on larger commercial launches and luxury yachts and superyachts, or looking for work through a crew placement agency then further qualifications may be required. 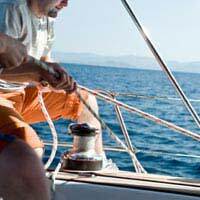 RYA’s ‘Day Skipper’ course is both a natural step on from ‘Competent Crew’ and a recommended foundation course for any type of career on board ship, with many specialist and advanced courses demanding Day Skipper as a prerequisite. As the name suggests the course provides basic grounding for skippering a ship. Crucially this is not simply a case of steering the vessel but taking charge and assuming responsibility for the boat and its crew. As well as helmsmanship, the course will also teach valuable all round crew skills such navigation, vessel maintenance, preparation and rules of the road. The course is split up into a shore-based theory part and an offshore hands-on stage, which are undertaken separately but are designed to complement one another. The Day Skipper course can also be taken in tidal or non-tidal waters depending on your own aspirations. Once this benchmark stage has been reached it is then recommended to use dedicated sailing forums to seek out immediate crew work and, if you have bigger employment ambitions, also help define what additional qualifications are required to achieve these aims. For example, if your long-term ambitions extend to finding a role on board superyachts then, according to the RYA, you may require a MCA Yacht Rating Certificate in addition to your Day Skipper. They also state that additional STCW training in sea survival, fire fighting and prevention, first-aid, personal safety and social responsibilities is also needed. For very young aspiring sailors, ‘Sail Training’ can offer a valuable first step in a potential career - although its aims are as much about personal development and adventure as they are about instilling skills for a potential employment at sea.